Following accusations that her scientist father gruesomely experimented on animals, sixteen-year-old Juliet watched as her family and her genteel life in London crumbled around her—and only recently has she managed to piece her world back together. But when Juliet learns her father is still alive and working on a remote tropical island, she is determined to find out if the old accusations are true. Accompanied by her father’s handsome young assistant, Montgomery, and an enigmatic castaway, Edward, Juliet travels to the island, only to discover the depths of her father’s insanity. Torn between horror and scientific curiosity, Juliet knows she must end her father’s dangerous experiments and escape her jungle prison before it’s too late. Yet as the island falls into chaos, she discovers the extent of her father’s genius—and madness—in her own blood. I remember when this book came out. I wanted to read it so terribly. Like, you have no idea. I kept looking for it everywhere, for over a year. I thought the cover was beautiful, and that the concept was fascinating. And, I finally DID get to read it! TL;DR – I was not disappointed! I chose this summary very specifically for its choice of comparison authors – Wells and Bray. They are spot on, in style and plot. The story was set in a very eery victorian London – in case you hadn’t picked up on that yet, haha. It was a very subtle darkness creeping through the pages, in a really entrancing way. While the book’s theme wasn’t innately dark or creepy (as in, it was not a thriller, or a horror novel, in my opinion), it did have me on the edge of my seat the entire time I read it. I really couldn’t put it down, it was captivating. The characters were really multidimensional and fascinating. This book presented very interesting historical commentary through its story – specifically through Juliet and her male co-stars. The way they were treated was very different, and Juliet was very aware of what a corrupt system she was a part of. She submitted to it, but also knew that the class system, and gender inequality of the time was kind of a load of hooey. The way this commentary wasn’t IN YOUR FACE, but it was still there, and I really enjoyed that approach overall. My one complaint – the love triangle. I could not STAND the way Juliet kept jumping between the two boys with her teenage hormones. I will say – it was absurdly realistic. She’s a teenage girl, who hadn’t been exposed to any (reputable) men who would take an interest in her. So, if there were TWO eligible young men who had active advances towards her, you can’t blame the girl for a bit of confusion. HOWEVER, I just kept cringing. I kind of predicted how it was going to end (and I am glad that’s how it went), and I just didn’t think it added to the plot. I think their individual character arcs were important, but the way the triangle fit in just didn’t work for me. 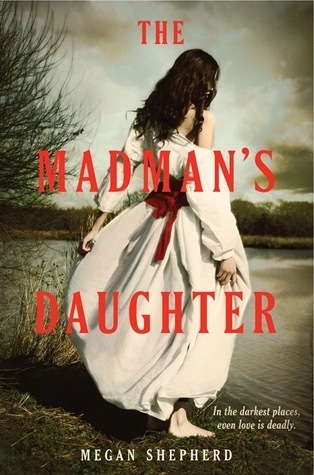 Overall, The Madman’s Daughter did not disappoint. It left off on QUITE the cliffhanger, and I plan to read the two sequels very soon. Although late to the game, I felt this novel definitely deserved a feature, as I adored it.